While protests in Woodlark Island, PNG, were able to stop a massive oil palm plantation in 2008, the future of the island remains uncertain. 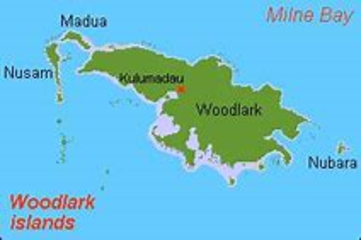 Woodlark Island (or Muyua island) is a coral island of Papua New Guinea, approximately 150 miles (240 km) northeast of the southeasternmost point of the island of New Guinea. Muyua’s rough surface of raised coral pinnacles (rising to 365 metres) in the south) is covered by dense jungle growth. Many of the 6000 island’s inhabitants directly depend on forest and marine resources. In 2006, the Malaysian-based company Vitroplant Ltd. launched the project of transforming 70% of the island into an oil palm monoculture as well as of building a biodiesel plant in Alotau. Most of the project would be developed on governmental land and the rest as “village plantation”, i.e. on customary land. As a result, more than one hundred islanders and supporters traveled to the Milne Bay provincial government headquarters in Alotau, to demand a halt to the palm oil project and claim their land back. They feared marine pollution, deforestation, forced proletarianization, and the effects of an imported workforce. The project was finally scrapped after a fierce opposition. In a statement to the media, the Minister for Agriculture said, "...the government will respect the wishes of the local landowners and will not go ahead with a project that the landowners do not want..."
There are also later threats from logging (Karridale company) and from gold mining (Kula Gold). International scientists, concerned by biodiversity loss. At the time (2007) The EDGE Team received an urgent memo from concerned researchers working on Woodlark Island (Muyuw) in the Milne Bay Province of Papua New Guinea. The government of Woodlark Island has recently granted permission to Vitroplant Limited to convert 60,000 hectares of the island into oil palm plantations. This is catastrophic news as the island itself is only 85,000 hectares in total. Leases for the oil palm project will cover almost the entire eastern half of Woodlark island, as well as large a proportion of the western half. These disastrous developments would not only have devastating effects on the environment and forest eco-systems but could potentially have dire consequences for the endemic Woodlark Cuscus (Phalanger lullulae) as the eastern side of the island is the stronghold for Woodlark cuscus populations. Development of Alternatives Woodlark Islanders continue to press the government of Papua New Guinea for community land rights. In most of Papua New Guinea, land is held by local communities, but this is not the case with the bulk of Woodlark Island. Why? Explain briefly. This particular struggle against Vitroplant was a success, but locals and conservationists told Mongabay (2014) that this will not be the end of it. A company, Karridale Limited, landed machinery on the island with plans to log 17,600 hectares or 22% of the island. More recently a foreign owned company, Kulawood Limited, has applied for a permit to clear 30,000 hectares of forest on Woodlark (Muyua) Island under the guise of an agriculture and tree planting project. "Loggers plan to clear 20 percent of tropical island paradise", Mongabay (28 April 2014) - a recent and worrying update on the situation.